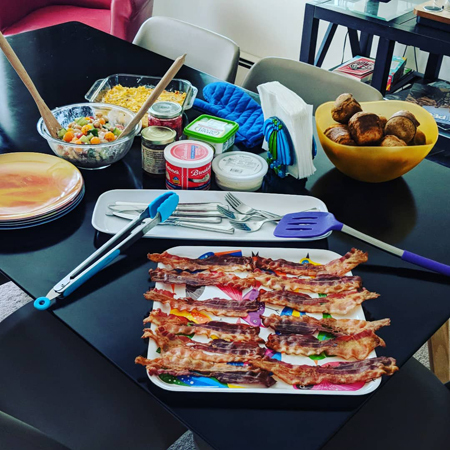 Last weekend, I made a big ol' brunch for our visiting friends, which included popovers (the recipe for which I shared last time), bacon cooked in the oven (which was sooooo yummy and perfectly crispy), a cheesy hashbrown casserole, and a fresh veggie and cannellini bean salad. The recipes for the later two are below. Directions: Preheat oven to 375 degrees F. Prepare a 9x9 baking dish with nonstick spray or grease. (If you need to prepare your bacon and onion, do those steps here.) In a large bowl, whisk together the eggs, milk, sour cream, salt, black pepper, red pepper, smoked paprika. Mix in bacon, onion, hash browns, and cheese. Transfer mixture into baking dish and spread evenly. Pop it in the oven and bake until the edges are nice and crispy, about 30-35 minutes. Serve immediately. Directions: Throw everything in a big bowl. Mix it up. Taste it and adjust the lemon juice and vinegar to your preference. Serve immediately or chill. Keeps well. Eats good for days!